The Evo chair from Bo Concept is one of those body-hugging affairs that you'll either find super comfortable or totally wretched. I happen to find it super comfortable, both physically and psychologically. For me it's not a bit unlike curling up in a puffy eggshell: Snuggly. Safe. Secure. A glance at the Evo should be enough to tell you if it will fit in with your decor or not. It has a distinctive look, both because of its round contours and because of the single metal pole that supports it. It seems like the designer was torn between making an office chair or an arm chair, so he made sure there was a bit of both in the Evo. The Evo comes in all the usual fabrics and a few unusual ones, like felt. The felt feels a little unsettling to me, probably because it reminds me of pool tables, which are fun but not the least bit comfortable to sit on. The fabric itself is warm but a bit raspy to the touch. The best place to see Evo is at a Bo Concept store, since Bo makes it. But I've seen it in other stores as well. The price starts at $1,099. 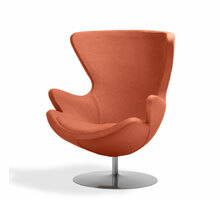 I just love the Evo chair. I have one in black leather.